Supremely located on the main street of Ornos Town, Eleftheria Hotel in Mykonos, provide clean and comfortable accommodation in Mykonos, within a small walking distance away from the popoular Ornos Beach. The hotel’s central location makes for an easy access to restaurants, bars and shops, as they are all located within a 2-minute walk distance. Eleftheria Hotel in Ornos Town Mykonos, is a smart option among budget hotels in Mykonos, combining affordable rates with decent quality, for an exceptional summer accommodation in Ornos-Mykonos, nearby the sandy beach of Ornos. The newly built Eleftheria Hotel in Mykonos and it welcoming owners, take care of every guests’ need and create a home away from home family ambience. 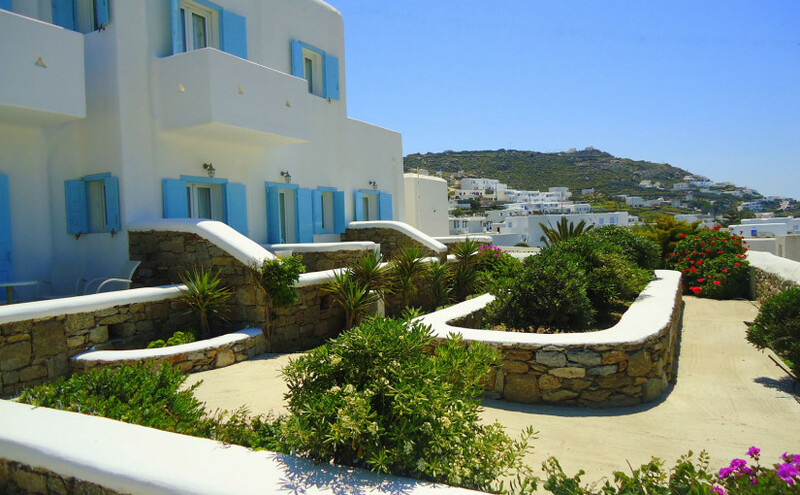 Ranging from double studios for 2 persons, up to studios for 3 persons, Eleftheria Studio Complex in Mykonos, provide accommodation in Mykonos, Greece, ideally for couples and small groups of friends, visiting the cosmopolitan Island of Mykonos Island and the wonderful beaches of Ornos and Korfos. The Eleftheria studios in Mykonos are divided to 2 floors. The upper floor studios feature a private balcony with beautiful sea view and table with chairs. The ground floor studios feature a private terrace wit ha wonderful garden view and table with chairs as well. The standard studios provide a double or 2 single beds and a small kitchenette, whilst the bigger studios provide a supplement sofa lounge area, where a third person can be accommodated. All studios include a kitchenette with all necessary equipment for light cooking and are centrally located just 1 minute away from from shops, bakeries restaurants, cafes, bars and supermarkets. The Ornos Beach is located just a 5 minute walk away from Eleftheria Studios in Mykonos. Centrally situated in the Settlement of Ornos, within 2 minutes distance walk away from the main street of Ornos Town and Ornos Beach, where numerous restaurants, bars and shops are located, Cyclades Studios offer shiny clean and modern furnished accommodation in Ornos-Mykonos, at very affordable rates. The family ambience of this small studio unit in Ornos, creates the ideal setting for visitors, as they get serviced with personal care and genuine Mykonian hospitality, for an experience of best family accommodation among studios in Mykonos at Ornos Beach. Cyclades Studios in Mykonos, is the ideal accommodation in Ornos-Mykonos, for couples, families and small groups of friends. 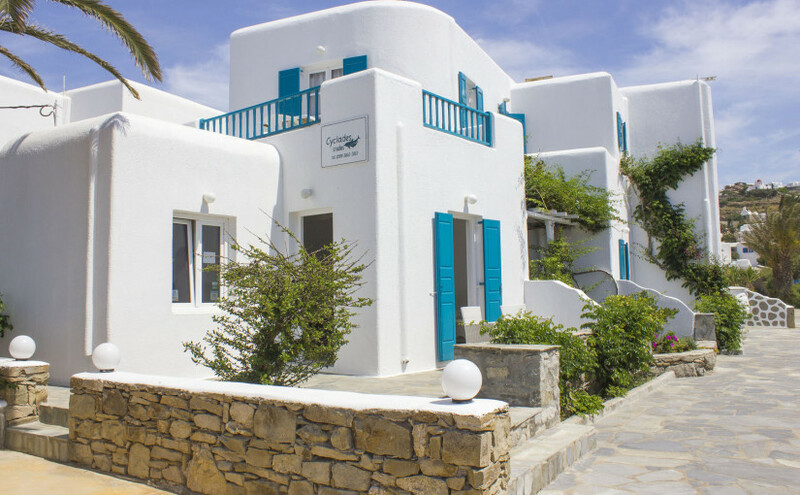 Ranging from double studios for 2 persons, up to studios for 4 persons, Cyclades Studio Complex in Mykonos, provide flexible accommodation for couples, families and small parties of friends, who wish to visit Mykonos Island and Ornos Beach, in Greece. Every studio of the property provides a small private balcony or terrace with table and chairs, ideally for chilling out during the relaxing time of the evening that the sun sets, after a long day on the beach. Furthermore, every studio provides a kitchenette with all necessary equipment and a small dining hall, ideally for guests who wish to do light cooking and prepare meals or snacks during their stay in Mykonos. All studios are supremely located, within a 2 minute walk away from the beach and shops, such as supermarkets, groceries, bakeries, restaurants and bars.